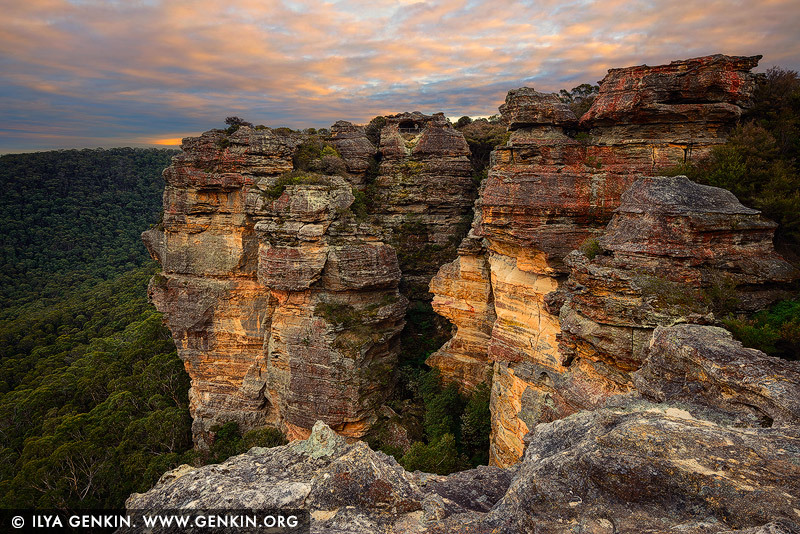 Hassans Wall near Lithgow in Blue Mountains was named by Governor Lachlan Macquarie during his trip to Bathurst in 1815 on the newly built Cox's Road because it reminded him the Rock Walls of Hassan in India. At Hassan in Southern India, the Rock Walls have deities carved on its face. We don't really know whether this is true or not, however the name came to be given, it has certainly stuck. This image belongs to the travel and nature stock photo library. This stock photo of Early Morning at Hassans Walls is available for licensing for commercial and editorial uses including websites, blogs, books, magazines, brochures and advertising. Restrictions may apply for images which contain third party copyrighted material or sensitive subjects. Photos of artwork are for editorial use only. This image id AU-HASSANS-WALLS-0002 of Early Morning at Hassans Walls, is copyrighted © by Ilya Genkin. This is not a public domain image.